Thorough & Swift Tile And Grout Cleaning Services In Houston, TX! The floor is a main part of any building, house, apartment, shop, store, supermarket, hotel, school and even streets – it is a main part of the decoration and a main part of our daily environments. The floor is almost always the first thing you notice when you walk into a room. Therefore, when it gets stained and dirty, tiles and grout included, it can be very annoying to the eye as its sight ruins the entire décor, but it can also hurt its function, as the floor can be sticky due to the filth accumulated on it. And it happens not only to floors, but also to bathroom tiles, sinks, toilet bowls, etc. The good new is, that the beautiful design can be restored with professional tile and grout cleaning. Flooring does not come cheap and it is expensive and time consuming to replace. Therefore, it makes no sense to replace it whenever it gets stained with dirt of any sort. Instead of wasting precious time and a lot of money, simply have the tiles and the grout between them professionally cleaned. 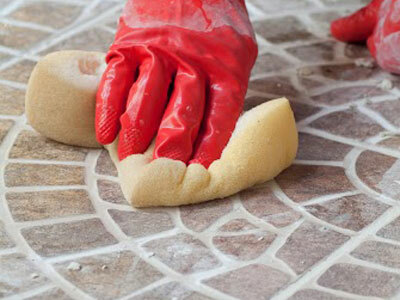 Indeed, it is much simpler to clean the floor tiles than to replace the entire surface. Whenever you feel that the floor, bathroom walls, bath tub, sinks or toilet bowl are just not as clean as they used to be, professional cleaning is in order. Our professional cleaning services will allow you to get rid of difficult stains and restore the glamor of the entire house. How Is Tiles and Grout Cleaning Performed? First of all, there are methods and machinery to allow us to perform thorough cleaning, such as high pressure washing, which is a method of applying water at high pressure to remove difficult stains. Auto scrubbing is another example for advanced technology that allows us to apply high pressure scrubbing with minimum effort. In addition, we use cleaning products which are both safe and strong in order to remove hard stains and dirt off tiles and grout. If you wish to restore your beautiful floor or bathroom walls, don't settle for less – call the professional team of Duct & Attic Cleaning Experts, Houston, and we will give your floor that sparkling touch. For more information, please contact us and we will advise you about the best solution for you. Is there a way to clean tiles with vinegar and baking soda? Using vinegar and baking soda is simple and cost effective way to remove small traces of dirt and mold and to keep your tiles sparkling. You can mix equal amounts of water and baking soda in the form of a paste, and then mix equal amounts of vinegar and warm water in a spray bottle. Apply the paste with a scrub brush and spray the vinegar mixture directly on the baking soda paste, which will start fizzing when it reacts to the acidic vinegar reacts. When finished, clean all the dirty vinegar and baking soda from the floor. This process is very simple but very intense, requiring bending and working inch by inch. Professional cleaners use special equipment and products that are much more effective and faster, making the procedure simple and pain free. Also, the vinegar might harm stone surfaces so avoid using it if your tiles are made of stone. Does cleaning grout with bleach really work? The traditional way of removing dirt from the grout has always been using chlorine bleach. Because it is a powerful oxidizer it can remove most stains from the grout, but it can also remove the color from the tiles and if the bleach accidentally splatters it can damage clothes, nearby towels and rugs. It also releases noxious fumes and can irritate respiratory issues and is potentially very harmful to birds. Therefore, although bleach is a solid cleaning product, it is not recommended for regular use.